There are not many sources of switches in two-rail "O". Atlas sells assembled switches and you can occasionally find European Roco and Peco assembled switches on e-Bay. 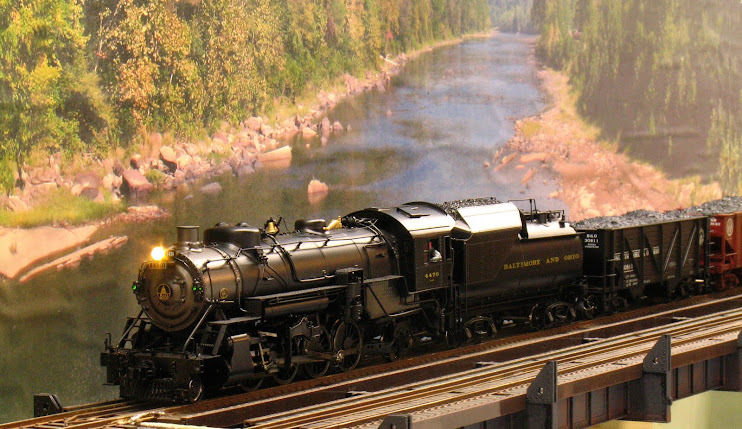 Other "switch kits" like Old Pullman's are available from B&K Precision and Right-of-Way. Of course there are Fast Tracks assembly fixtures and you can always hand lay from scratch. "Whose switches are you using?" 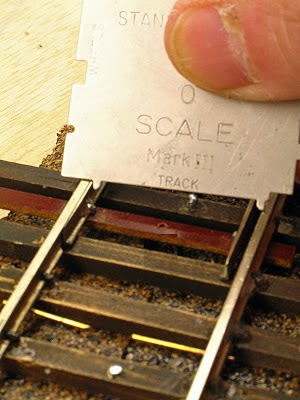 is a common question whenever O Scalers gather at someone's layout. What usually follows is a long tale of woe as the layout owner relates his quest for the perfect switch. The pros and cons of each brand and approach are recounted with the listeners nodding in sage agreement. At one such gathering (not at my layout) I was asked if I used Old Pullman switches. I quipped that I had six of them, I had installed one and the other five were for sale. This brought knowing chuckles from the group. The mine switch is laid in a short section of straightaway (about 16") between reverse curves. This straightaway was too short to take a switch built using Fast Tracks fixtures, even assuming that I had one. Nor would a switch hand laid using one of Fast Tracks' templates fit. It was too short for an Atlas #5 or a Roco LH switch which I happened to have on hand. I could have built a turnout to fit; that would have taken a weekend or two. That left the Old Pullman switch, which fit perfectly. The fact that this switch fit into a space where no other one would to me belies the fact that this switch could be built to NMRA standards. I gave in to temptation; I should have known better than to ever say 'never again'. 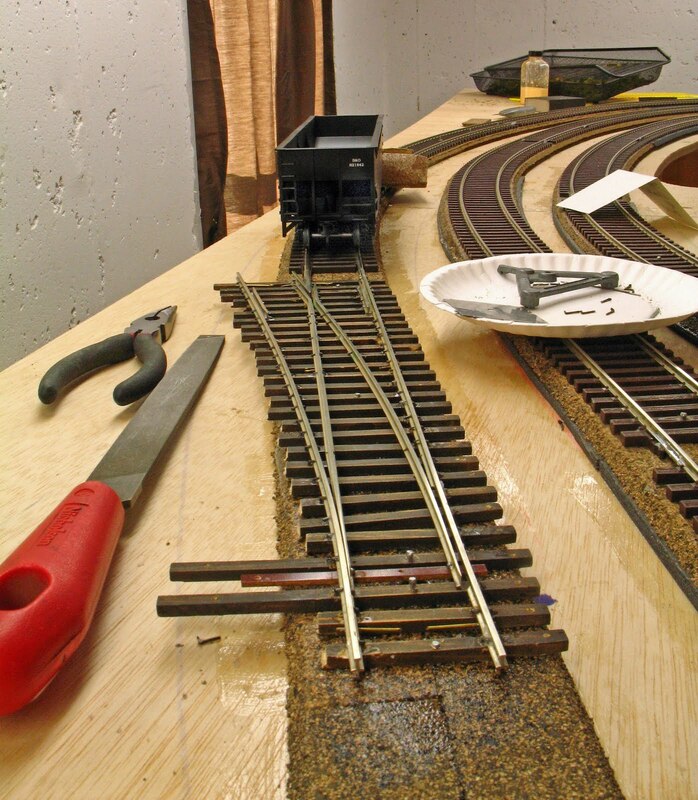 The Old Pullman switch saves only a little time over scratch building inasmuch as the points and frog are already formed for you - if you can live with the parts that you get. The wing rails and guard rails are already formed too, but like the rest of the switch, requires a lot of work to get the final product to pass the NMRA gauge. Long story short, I could get most measurements on the assembled switch to pass the gauge, except for the area of the points. As you can see from the next photo, the track gauge is tight at the points and for a considerable distance along each closure rail. Worse still, the gap between the open point and the stock rail will not admit the NMRA gauge, which means that the opening is too tight; a fact confirmed when running my All-Nation B&O B18 through for the first time and before I had isolated the closure rails from the frog. It shorted. 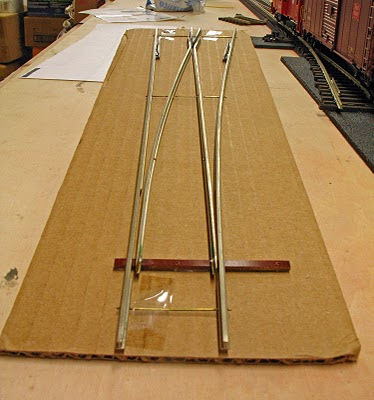 I can't just widen the stock rails to correct both problems as then the gauge at the approach to the switch is too wide to mate to flex track. The switch will work because wheelsets gauged to NMRA standards have enough clearance to pass slightly tight gauge trackwork. The shorting problem with the B18 has been only partially fixed by isolating the closure rail and then making it the same polarity as the adjoining stock rail. The B18 still exhibits intermittent anomalous behavior going through the switch. It could be that the B18's wheels are out of gauge; more troubleshooting is needed.